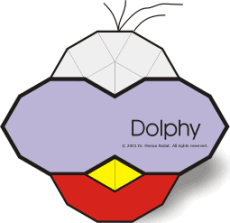 Dolphy puzzle is a variant of Florian's Fishes in which pieces comprise two squares plus four equilateral triangles. This puzzle use only six pieces from the full set of 49 pieces which covers all possible arrangements. In all other tessellations (tilings) of the plane, mathematical methods can be applied in helping to derive solutions. This is not true for Dolphy puzzle which relies entirely on trial and error. This kind of puzzle can be quite challenging, even for children. Do not use computers! This does not make any sense. The puzzle board looks like a face, of a dolphin, of course. The pieces have fish names because of their similarity with some well known fish species. The pieces have no principal faces, are completely asymmetrical, have different shapes and can be placed on the game board with either of the two faces uppermost. To solve the puzzle the pieces must fill the entire area of the game board.